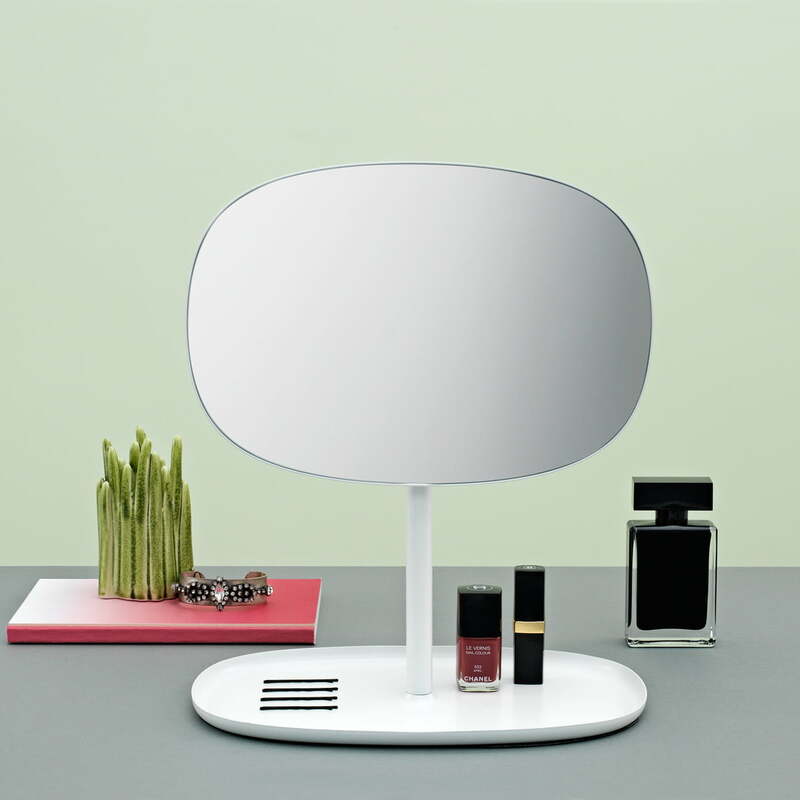 Javier Moreno created an elegant table mirror with several functions for Normann Copenhagen. The shaping is organic. 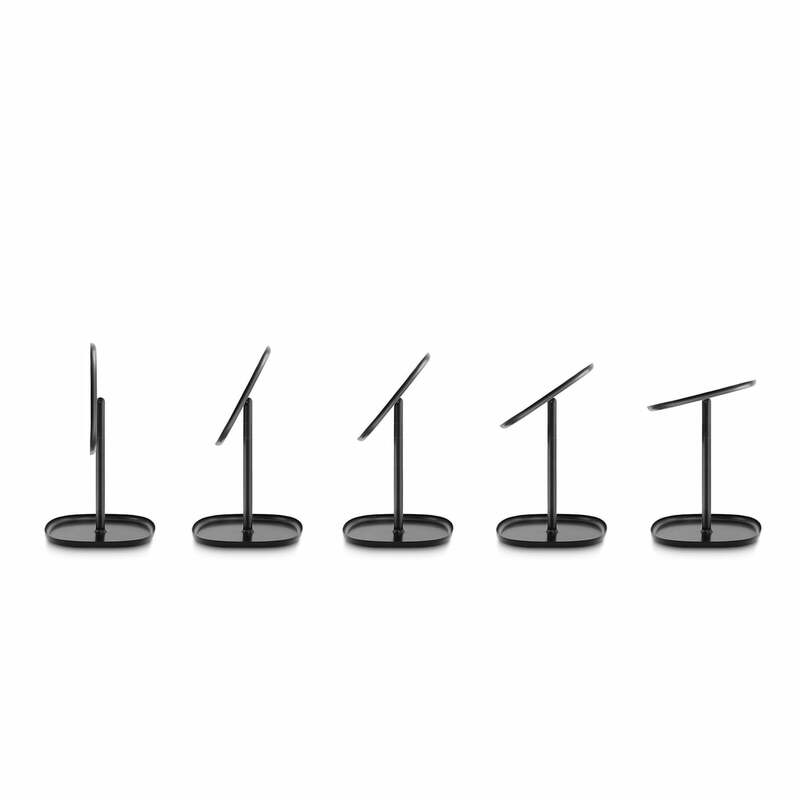 To the top, downwards and once around itself: Flip is rotatable. The base in form of a tray makes Flip an object of practical storage space for small things. 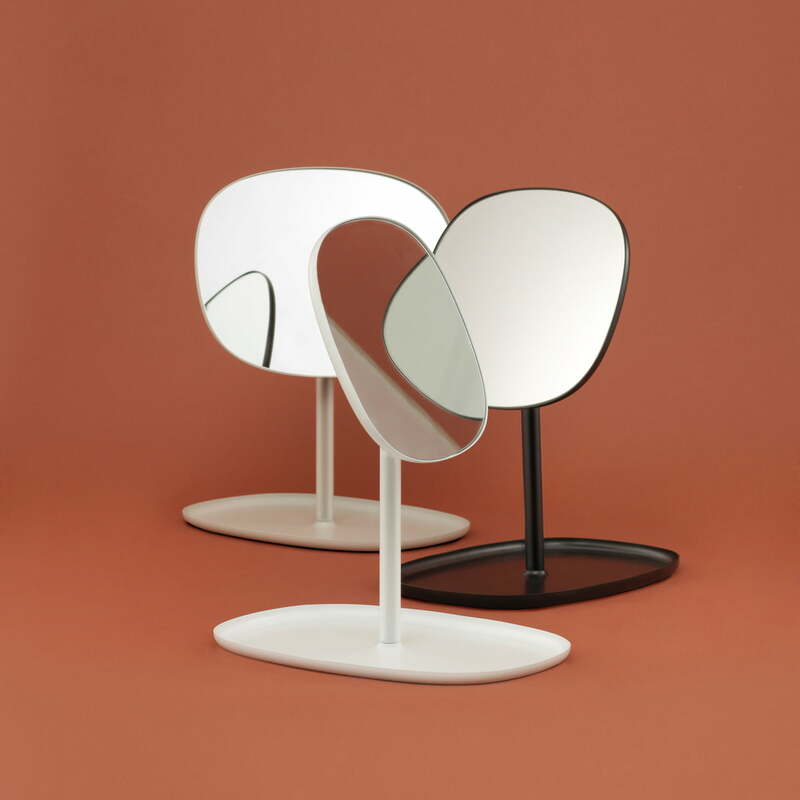 Javier Moreno's design studio knowingly renounced geometric rules for the shape of the mirror – it should be free and organic. The soft silhouette makes up an interesting contrast to the materials glass and steel and it offers a friendly and inviting appearance to the mirror. The original idea for Flip was the traditional hairdresser's table, where one is able to check one's appearance and to store all the small necessary things at the same time. The base is like a small tray and ideal to store jewellery, make-up, keys, etc. Javier Moreno about his product: "A mirror fulfils its function, but I wanted to create a mirror with more to offer than that. Usually, the last glimpse of everyone before leaving the house is the one in the mirror. So why don't dropping all the small necessary things we need before we leave the house there?" Flip is available in different colours and therefore suitable in most of the furnishing styles. Use the Flip mirror on a chest of drawers in the corridor, in the bedroom as make-up table or everywhere it might be necessary. Details Clean with damp cloth only! 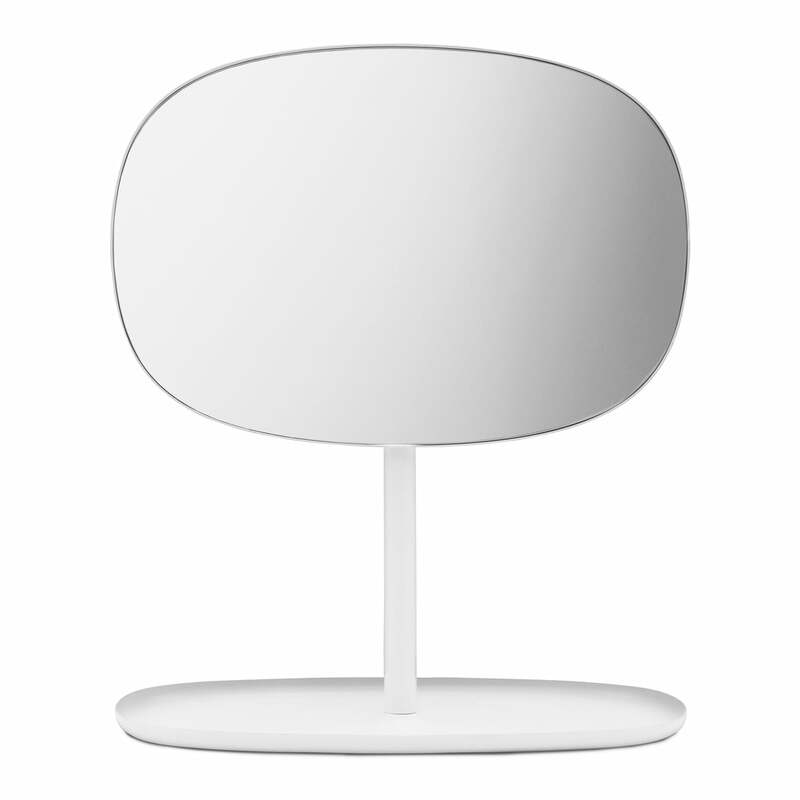 Frontal single image of the Flip Mirror in white by designer Javier Moreno for Normann Copenhagen. The flippable mirror is manufactured of steel and mirror glass. 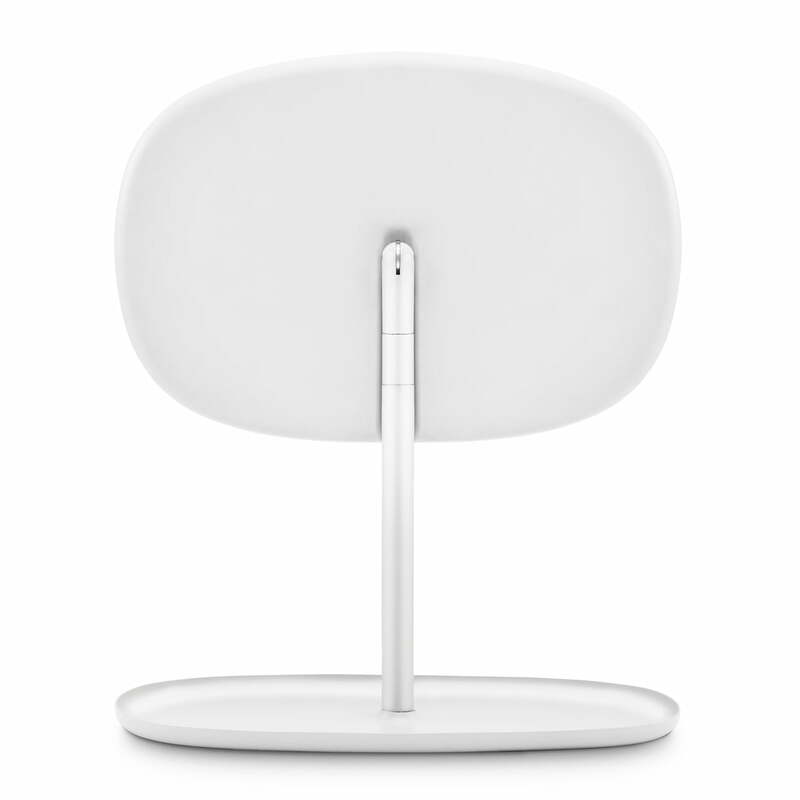 Single image of the back side of the white Flip Mirror, designed by Javier Moreno for Normann Copenhagen. The mirror has the dimensions 34.5 x 19.5 x 28 cm (H x D x L). 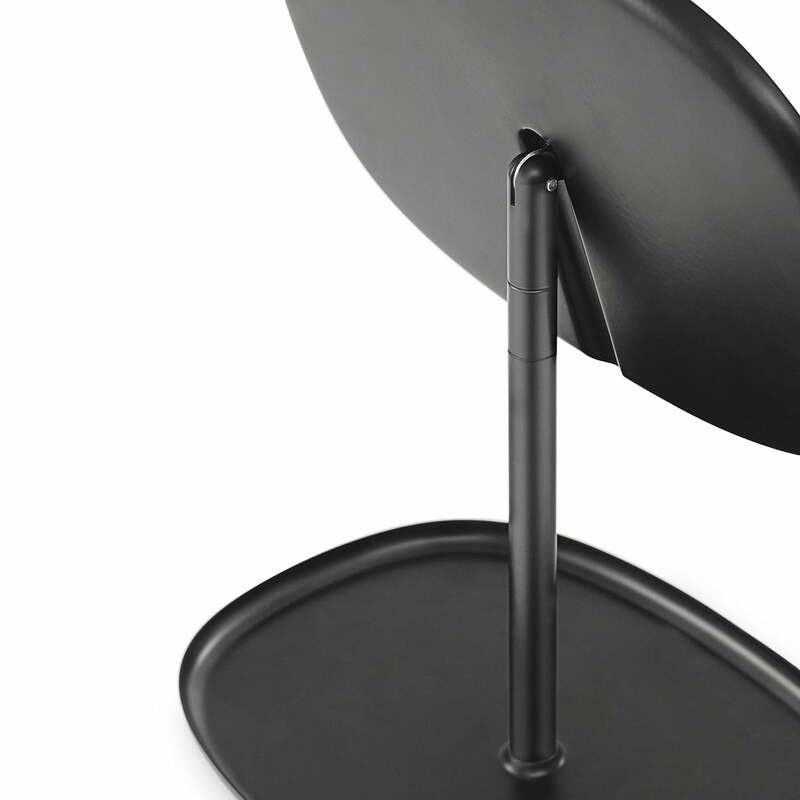 The Flip mirror by Normann Copenhagen in black can flip around in nearly all directions. 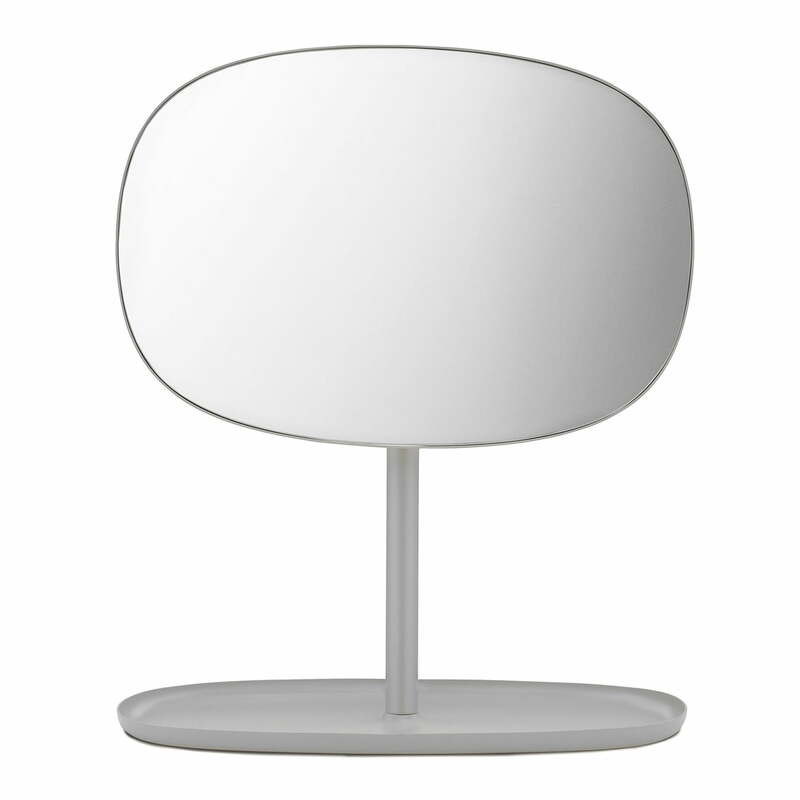 The standing table mirror features a nice organic-shaped expression. 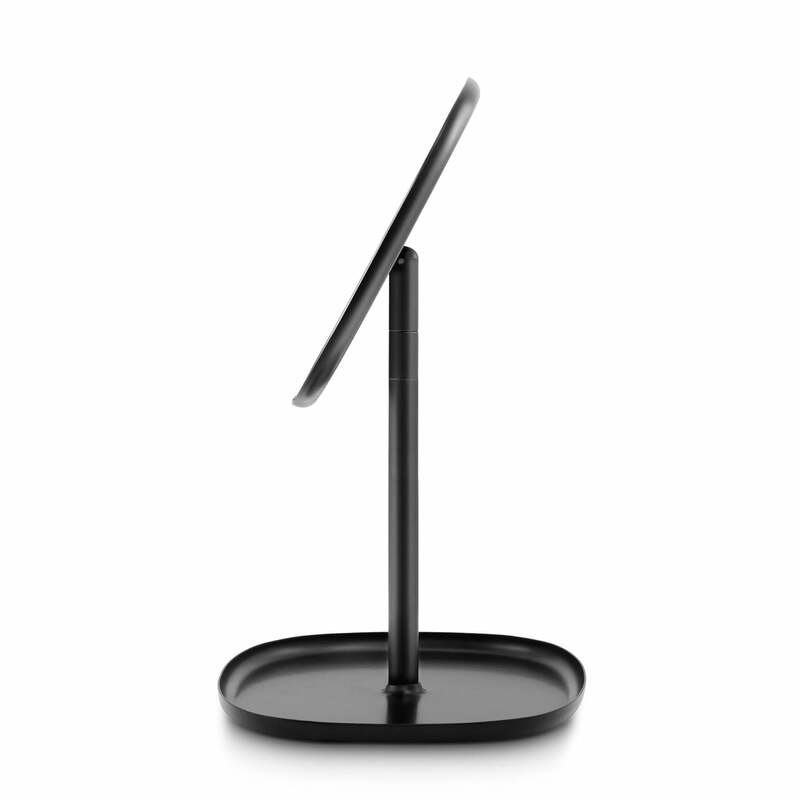 Lateral single image of the Flip Mirror in black, designed by Javier Moreno for Normann Copenhagen. The base is like a small tray and ideal to store jewellery, make-up, keys, etc. The Flip Mirror in the side view. 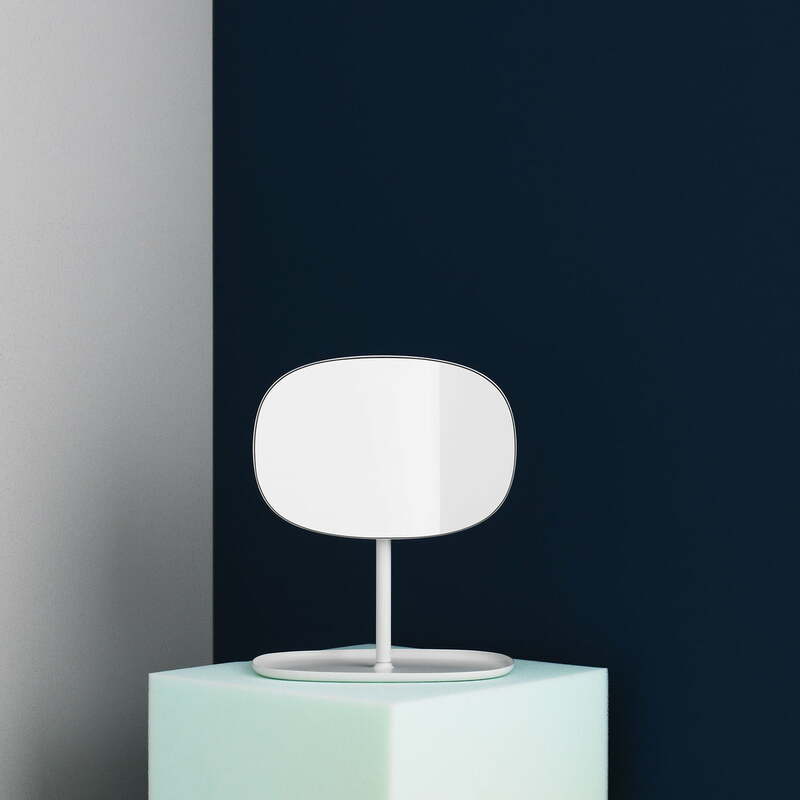 The mirror from Normann Copenhagen is rotating sideways as well as up and down and has a wonderful organic appearance. The design language is organic. 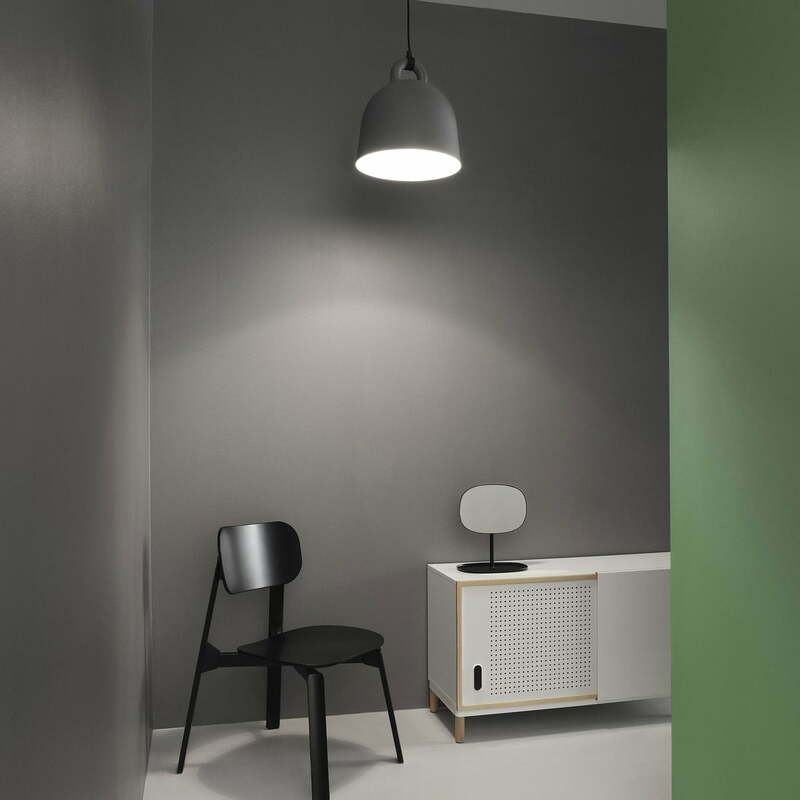 To the top, downwards and once around itself: Flip, designed by Javier Moreno for Normann Copenhagen, is rotatable. The base in form of a tray makes Flip an object of practical storage space for small things, e.g. like nail polish or lipstick. 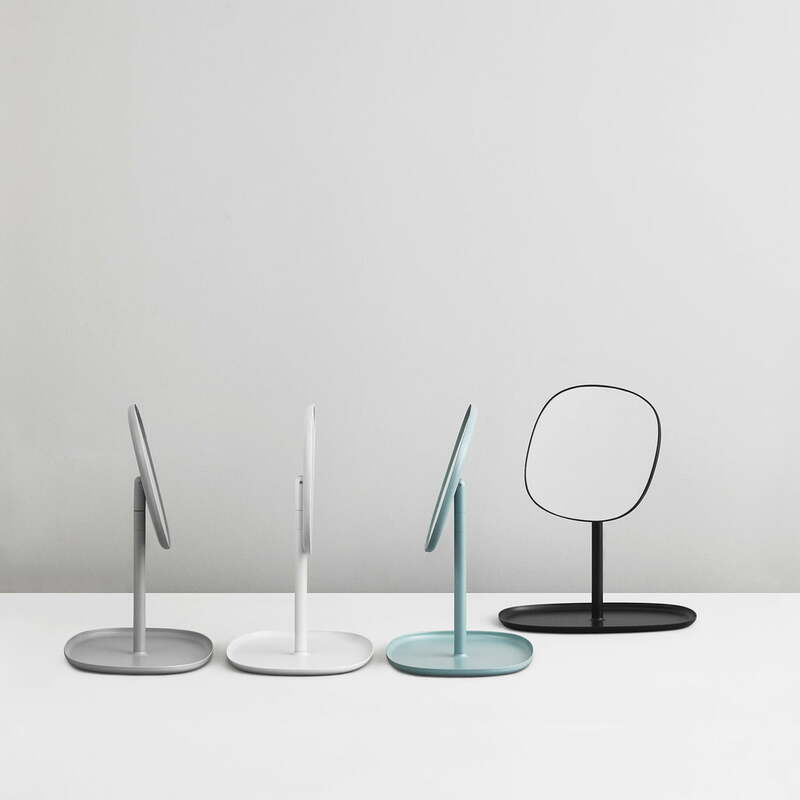 The original idea for Flip Mirror by Normann Copenhagen was the traditional hairdresser’s table, where one is able to check one’s appearance and to store all the small necessary things on the base, which has the form of a tray, at the same time. The soft silhouette makes up an interesting contrast to the materials glass and steel and it offers a friendly and inviting appearance to the mirror. 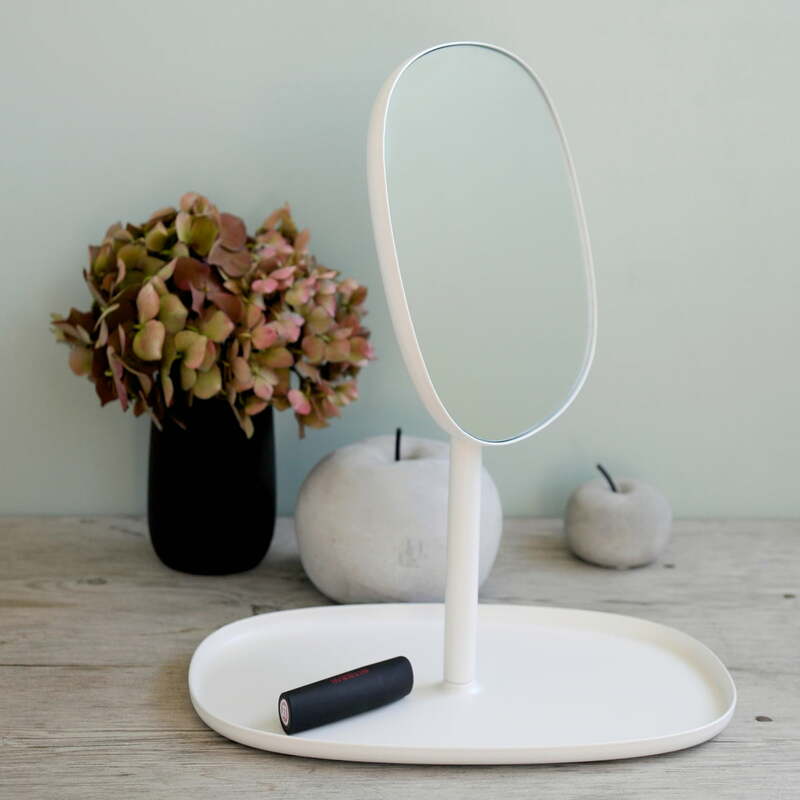 The Flip Mirror, designed by Javier Moreno for Normann Copenhagen, is available in the colours black, white and sand. The soft silhouette makes an interesting contrast to the materials glass and steel and gives the mirror a friendly and inviting look. 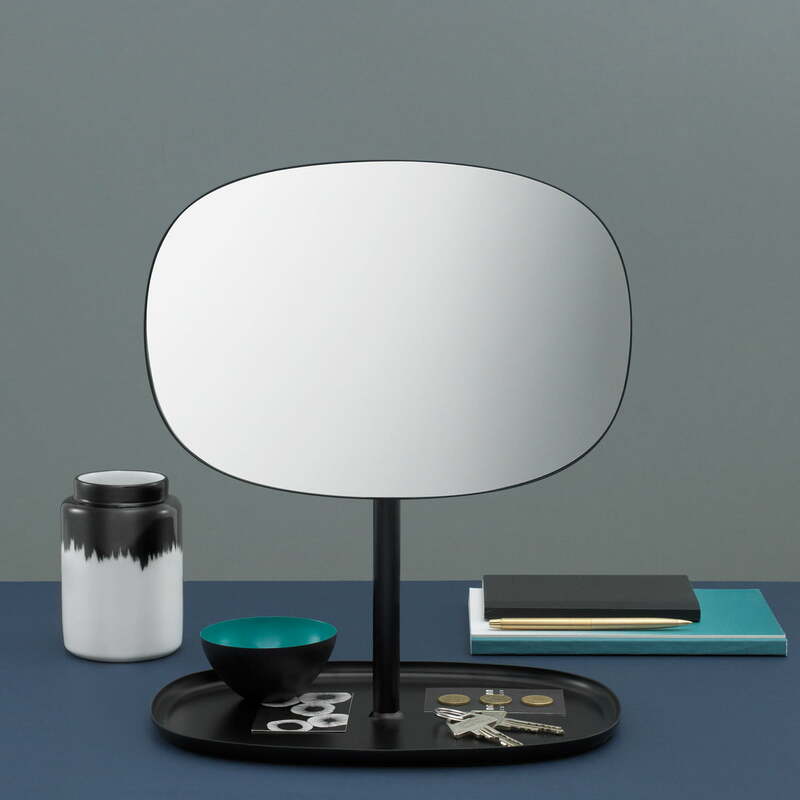 The Flip mirror designed by Javier Moreno for Normann Copenhagen. The Flip mirror and the Bell Pendant Lamp by Normann Copenhagen build a modern and cosy atmosphere. The thought-through pieces of furniture are true eye-catchers. The soft silhouette makes an interesting contrast to the materials glass and steel and gives the mirror a friendly and welcoming look. The base is designed like a little tray to keep jewellery, make-up, keys, etc.